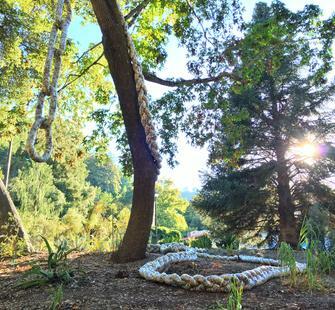 Coiling down from a tree on Montalvo’s grounds, Tell-Tale II is an enormous braid made from newspaper, cotton, plastic, and tape. Inspired by the Brothers Grimm story Rapunzel, Hovey imagines replacing the characters of the classic fairy tale with contemporary equivalents to explore how the government and media can collude to keep us captive in a fortress constructed from our own fears and misunderstanding. Knowledge rather than a prince can provide relief, hope, and the means of escape. Acknowledgements: Patricia Adams; Christine, Miranda, and Jason Aochi; Jane Du; Hilari Fan; Kelcie Fan; Shilpa, Rayan, and Sareena Garg; Irene Han; Drean Lu; Justin Mabie; Debbie Parker; Tisbe Rinehart; and Caitlyn Yee.